In the morning we had Lan Zhou cold noodles for breakfast then we went back to our hostel to take a shower. After that we were back on the highway near noon. There are two highways to Xin Jiang which you can take. The G30 at Northern Gansu province or the desert highway in Ching Hai province. We thought the desert highway should be the more beautiful and short one, so we gave it a try! It took us one and half hour to leave the huge Lan Zhou city and luckily we catched a car to Xining city. 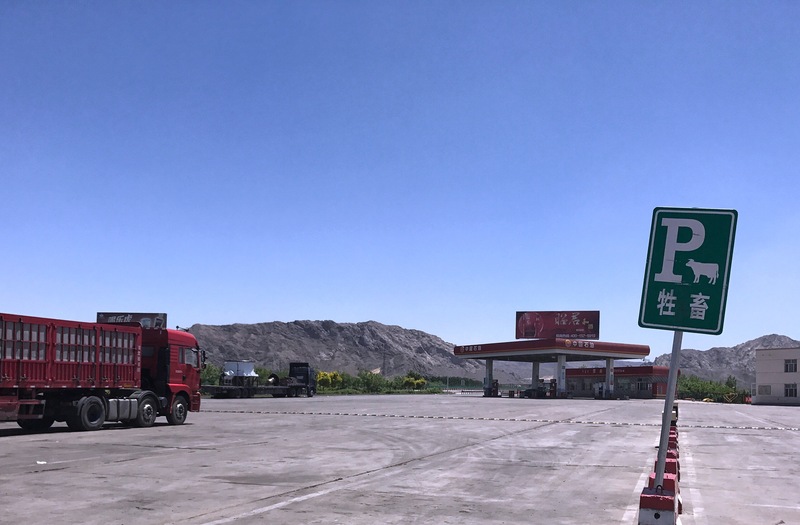 We got off on a petrol station before Xining city and found out all the cars were going to Xining, no one was going further. That was a dead end.
" Xining is a big city, it’s hard to get out of it." People told us there are not much cars going the desert highway. “What if we get trapped in the desert, that will be the end." We considered different situations and one hour later we decided to get back to Lan Zhou. For a good reason? It was 8 p.m. when we were back to Lan Zhou to try again the other option. I had a strange insistence to camp near the highway and leave it early next morning. And that was the worst night of our road trip. In the evening before going to camp we tried to hitchhike to the service area which was located 2 kilometers from the highway entrance but without success. The highway entrance Lan Zhou Bei (蘭州北) was in very bad condition. Too much traffic, and the whole place looked like under construction. It’s sandy, messy. We gave up and walked up to the hills beside the highway. There were huge dogs in the cage on the way, which scared us to death, when they started to bark at us from the dark. We climbed up the hills, found the most hidden place beside a railway tunnel with a lot of trains passing by, but I was so tired I didn’t care too much. I fell asleep with the noise of the train horn and in the middle of the night I woke up because of a crazy dog which was barking around our tent. Next morning we were lucky to get a ride to the service area in short time, which was just 3 kilometers away from highway entrance. Today’s mission was to hitch a ride to the west and it turned out to be an endless waiting. It was a hot, sunny day, and during our 3 hours of waiting, even the service area staff came to us and suggested to take a bus. I tried to convince myself to give up and take the bus. While I went to toilet, Misha had a misunderstanding communication with a driver, and we took a car heading wrong way. 50 kilometers later, we were dropped off at the junction of two highways. There were not many cars and each of them passed through with high speed. We were standing on the highway and luckily a car stopped for us. We hitched a ride with a Russian speaking driver. He has a business in Central Asia, so he learned Russian by himself. I made Misha talking to him, so I had my own time to watch scenery. Tian Mountain(天山）, ancient frontier walls, desert… driver told us the desert highway we wanted to go is dangerous for camping because there are big bad wild wolves! I was really happy that our long waiting time in Lan Zhou was worth it!